News has reached me this morning of the death of Anselm Hollo the incomparably original and probative Finnish-American writer and translator. If sadness is custom, losing a poet is its shadow. No elegy captures shadows. Auden perhaps came closest, observing at the death of Yeats how the poet becomes his admirers. How heavy the poet’s cloak feels. I know I’m grieving with thousands of poets and readers who loved Anselm Hollo’s works and days. I first saw Anselm in an upstate New York supermarket in 1972. I was 17, almost totally blind, anorexic, shy as hell, and just discovering poetry by way of Stephen Berg and Robert Mezey’s anthology “Naked Poetry”. I knew who Anselm was, knew he was teaching at the local college. There he was, walking the canned goods aisle at “Loblaw’s Grocery” with a knee length leather coat, a dizzying mane of “late Beatles” hair, giving off the dissociational fixedness of a man in multiple worlds. I have carried this particular poet’s books with me now for over thirty years. His poems, translations and prose have been keen influences on my growth as a poet and writer. It would be easy to say my admiration for Anselm’s work is tied to my own Finnish heritage, but that’s not the case. In fact Anselm was a cultural refugee from Finland. One may imagine (as Robert Creeley did, mistakenly) that Finland is filled with outré jazzy transnational shamans, but it isn’t so. Hollo found his voice in the United States when, as a high school exchange student in Iowa in the 1950’s he heard Bill Haley and the Comets. Thereafter he found his way to cities and towns where poetry was creating new communities. In fact when I think of Anselm I always think of gatherings of poets. Yes he was Finnish but in the way of Victor Turner’s “liminal” figure, the man or woman who leaves the ritual circle of the customary culture, who travels widely, who sends back news from unknown terrain. His translations of poems by Paavo Haavikko and Pentti Saarikoski inspired me to undertake a Fulbright year in Helsinki in 1981-82. In my memoir Planet of the Blind I describe the dark and provincial quality of my research year in Finland. Poets wouldn’t meet with me. Scholars at the university thought contemporary poetry was beneath contemplation. Maybe things are better now as much has changed–Finland is more international both in cultural and business terms today. But whatever the case I discovered there were not tons of statically alive, multi-cultural, extroverted Anselm Hollo-like Finns walking the Esplanade in Helsinki. It was a place of sharpened introverts. Years later when Bob Creeley also ventured to Finland on a Fulbright the same discoveries befell him. He later described his year in Finland as remarkably lonely. We both found out that Anselm was a Finn in much the way John Lennon was English. 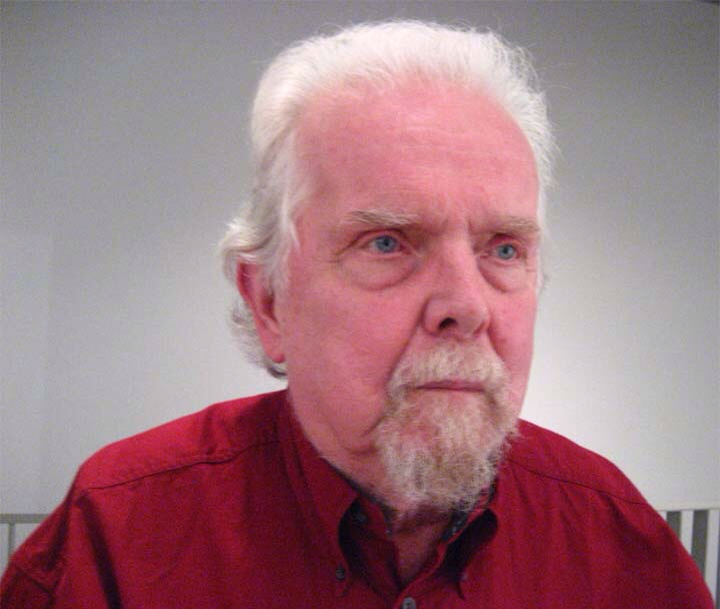 Anselm Hollo is an international poet with a Finnish caraway seed under his tongue. Hollo was the anti-laureate as Robert Archambeau wrote. I have always liked anti poesis Liked it the first time I saw it in person there among the cans of creamed corn in Geneva, New York when I was 17, weighed 102 pounds, and didn’t know how to live.